America and a broad coalition acted first in Afghanistan by destroying the training camps of terror and removing the regime that harboured al-Qaeda. In a series of raids and actions around the world, nearly two-thirds of al-Qaeda's known leaders have been captured or killed, and we continue on al-Qaeda's trail. We have exposed terrorist front groups, seized terrorist accounts, taken new measures to protect our homeland and uncovered sleeper cells inside the United States. And we acted in Iraq, where the former regime sponsored terror, possessed and used weapons of mass destruction, and for 12 years defied the clear demands of the United Nations Security Council. Our coalition enforced these international demands in one of the swiftest and most humane military campaigns in history. For a generation leading up to 11 September 2001, terrorists and their radical allies attacked innocent people in the Middle East and beyond, without facing a sustained and serious response. The terrorists became convinced that free nations were decadent and weak. And they grew bolder, believing that history was on their side. Since America put out the fires of 11 September and mourned our dead, and went to war, history has taken a different turn. We have carried the fight to the enemy. We are rolling back the terrorist threat to civilisation, not on the fringes of its influence, but at the heart of its power. This work continues. In Iraq, we are helping the long-suffering people of that country to build a decent and democratic society at the centre of the Middle East. Together we are transforming a place of torture chambers and mass graves into a nation of laws and free institutions. This undertaking is difficult and costly, yet worthy of our country and critical to our security. The Middle East will either become a place of progress and peace, or it will be an exporter of violence and terror that takes more lives in America and in other free nations. The triumph of democracy and tolerance in Iraq, in Afghanistan and beyond would be a grave setback for international terrorism. The terrorists thrive on the support of tyrants and the resentments of oppressed peoples. When tyrants fall and resentment gives way to hope, men and women in every culture reject the ideologies of terror and turn to the pursuits of peace. Everywhere that freedom takes hold, terror will retreat. Some of the attackers are members of the old Saddam regime who fled the battlefield and now fight in the shadows. Some of the attackers are foreign terrorists, who have come to Iraq to pursue their war on America and other free nations. We cannot be certain to what extent these groups work together. We do know they have a common goal, reclaiming Iraq for tyranny. Most, but not all, of these killers operate in one area of the country. The attacks you have heard and read about in the last few weeks have occurred predominantly in the central region of Iraq, between Baghdad and Tikrit, Saddam Hussein's former stronghold. The north of Iraq is generally stable and is moving forward with reconstruction and self-government. The same trends are evident in the south, despite recent attacks by terrorist groups. Though their attacks are localised, the terrorists and Saddam loyalists have done great harm. They have ambushed American and British service members who stand for freedom and order. They have killed civilian aid workers of the United Nations who represent the compassion and generosity of the world. They have bombed the Jordanian embassy, the symbol of a peaceful Arab country. And last week they murdered a respected cleric and over 100 Muslims at prayer, bombing a holy shrine and a symbol of Islam's peaceful teachings. This violence is directed not only against our coalition, but against anyone in Iraq who stands for decency and freedom and progress. There is more at work in these attacks than blind rage. The terrorists have a strategic goal. They want us to leave Iraq before our work is done. They want to shake the will of the civilised world. In the past, the terrorists have cited the examples of Beirut and Somalia, claiming that if you inflict harm on Americans, we will run from a challenge. In this, they are mistaken. Two years ago, I told the Congress and the country that the war on terror would be a lengthy war, a different kind of war fought on many fronts in many places. Iraq is now the central front. Enemies of freedom are making a desperate stand there, and there they must be defeated. This will take time and require sacrifice. Yet we will do what is necessary, we will spend what is necessary to achieve this essential victory in the war on terror, to promote freedom and to make our own nation more secure. America has done this kind of work before. Following World War II, we lifted up the defeated nations of Japan and Germany and stood with them as they built representative governments. We committed years and resources to this cause. And that effort has been repaid many times over in three generations of friendship and peace. America today accepts the challenge of helping Iraq in the same spirit, for their sake and our own. Our strategy in Iraq has three objectives: Destroying the terrorists; enlisting the support of other nations for a free Iraq; and helping Iraqis assume responsibility for their own defence and their own future. First, we are taking direct action against the terrorists in the Iraqi theatre, which is the surest way to prevent future attacks on coalition forces and the Iraqi people. We are staying on the offensive, with a series of precise strikes against enemy targets increasingly guided by intelligence given to us by Iraqi citizens. Two multinational divisions, led by the British and the Poles, are serving alongside our forces. And in order to share the burden more broadly, our commanders have requested a third multinational division to serve in Iraq. Some countries have requested an explicit authorisation of the United Nations Security Council before committing troops to Iraq. I have directed Secretary of State Colin Powell to introduce a new Security Council resolution which would authorize the creation of a multinational force in Iraq to be led by America. I recognise that not all our friends agreed with our decision to enforce the Security Council resolutions and remove Saddam Hussein from power, yet we cannot let past differences interfere with present duties. Terrorists in Iraq have attacked representatives of the civilised world and opposing them must be the cause of the civilised world. Members of the United Nations now have an opportunity, and the responsibility, to assume a broader role in assuring that Iraq becomes a free and democratic nation. Third, we are encouraging the orderly transfer of sovereignty and authority to the Iraqi people. 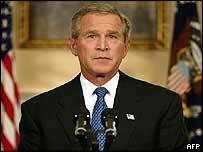 Our coalition came to Iraq as liberators and we will depart as liberators. Right now Iraq has its own governing council, comprised of 25 leaders representing Iraq's diverse people. The governing council recently appointed cabinet ministers to run government departments. Already more than 90% of towns and cities have functioning local governments which are restoring basic services. We are helping to train civil defence forces to keep order and an Iraqi police service to enforce the law, a facilities protection service, Iraqi border guards to help secure the borders and a new Iraqi army. In all these roles, there are now some 60,000 Iraqi citizens under arms, defending the security of their own country. And we are accelerating the training of more. Iraq is ready to take the next steps toward self-government. The Security Council resolution we introduce will encourage Iraq's governing council to submit a plan and a timetable for the drafting of a constitution and for free elections. From the outset, I have expressed confidence in the ability of the Iraqi people to govern themselves. Now they must rise to the responsibilities of a free people and secure the blessings of their own liberty. Our strategy in Iraq will require new resources. We have conducted a thorough assessment of our military and reconstruction needs in Iraq, and also in Afghanistan. I will soon submit to Congress a request for $87bn. The request will cover ongoing military and intelligence operations in Iraq, Afghanistan and elsewhere, which we expect will cost $66bn over the next year. This budget request will also support our commitment to helping the Iraqi and Afghan people rebuild their own nations after decades of oppression and mismanagement. We will provide funds to help them improve security. And we will help them to restore basic services, such as electricity and water, and to build new schools, roads and medical clinics. This effort is essential to the stability of those nations, and therefore to our own security. Now and in the future, we will support our troops and we will keep our word to the more than 50 million people of Afghanistan and Iraq. The people of Iraq are emerging from a long trial. For them, there will be no going back to the days of the dictator, to the miseries of humiliation he inflicted on that good country. For the Middle East and the world, there will be no going back to the days of fear when a brutal and aggressive tyrant possessed terrible weapons. And for America, there will be no going back to the era before 11 September 2001, to false comfort in a dangerous world. We have learned that terrorist attacks are not caused by the use of strength. They are invited by the perception of weakness. And the surest way to avoid attacks on our own people is to engage the enemy where he lives and plans. We are fighting that enemy in Iraq and Afghanistan today so that we do not meet him again on our own streets, in our own cities. The heaviest burdens in our war on terror fall, as always, on the men and women of our armed forces and our intelligence services. They have removed gathering threats to America and our friends, and this nation takes great pride in their incredible achievements. We are grateful for their skill and courage, and for their acts of decency, which have shown America's character to the world. We honour the sacrifice of their families, and we mourn every American who has died so bravely, so far from home. The Americans who assume great risks overseas understand the great cause they are in. Not long ago I received a letter from a captain in the 3rd Infantry Division in Baghdad. He wrote about his pride in serving a just cause and about the deep desire of Iraqis for liberty. "I see it," he said, "in the eyes of a hungry people every day here. They are starved for freedom and opportunity." And he concluded: "I just thought you'd like a note from the front lines of freedom." And I want each of them to know - your country thanks you, and your country supports you. Fellow citizens, we have been tested these past 24 months, and the dangers have not passed. Yet Americans are responding with courage and confidence. We accept the duties of our generation. We are active and resolute in our own defence. We are serving in freedom's cause, and that is the cause of all mankind. Thank you. And may God continue to bless America. "We are rolling back the terrorist threat to civilisation"